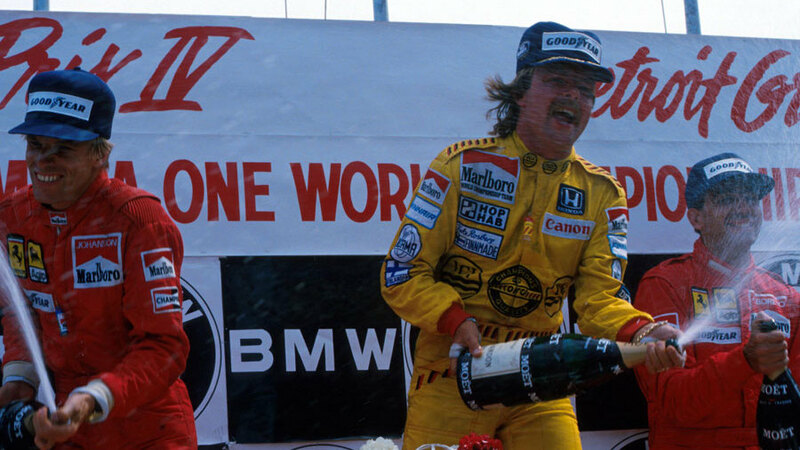 Keke Rosberg underlined his liking for street circuits with victory in a Williams at the Detroit Grand Prix. His only two wins in the previous couple of seasons had been in Monaco in 1983 and Dallas in 1984. The Friday and Saturday sessions were notable for rain and moans by drivers who found the bumpy surface a nightmare for their cars' set-ups. Ayrton Senna took his fourth pole in five races with Nigel Mansell's Williams alongside him. Rosberg had only qualified in fifth on harder tyres but seeing his team-mates better performance switched to a softer option for the race itself. The opening laps provided more entertainment at the front than what followed. Mansell beat Senna into the first corner but on the second lap Senna retook the lead and Rosberg also passed his team-mate, opening a seven-second lead by the eighth lap. Then Senna pitted to hand the lead to Rosberg and the Finn proceeded to build an advantage that was up to 33 seconds by the halfway point. Behind him there was action. The McLarens of Niki Lauda and Alain Prost both suffered brake problems. Lauda limped into the pits at the end of the tenth lap and called it a day but Prost battled on until he failed to negotiate a corner. Mansell led the chase until two spins dropped him to sixth and then after a quick pit stop he crashed into a tyre barrier which had been stripped of its tyres by an earlier incident involving Senna. Mansell limped away from the accident with an injured thumb. Rosberg was 25 seconds ahead of Stefan Johansson 13 laps from home when he pitted due to his engine temperature rising. It turned out a plastic bag had lodged itself in a sidepod and was causing overheating, but the stop allowed him to change tyres. That proved crucial as he rejoined only two seconds ahead of Johansson but his fresher rubber allowed him to pull away again. Senna had worked his way back to challenge Johansson but he misjudged a corner and ploughed into a barrier. It was a temporary reprieve as the front brake disc on Johansson's Ferrari exploded and he had to limp round the last three laps nursing his car to the finish and using the gears to brake. Alboreto closed to within six seconds of his team-mate to take third and extend his lead in the drivers' championship to seven points over Elio de Angelis who came fifth. In between them came the Tyrrell of Stefan Bellof which completed the race without a nose cone after an incident soon after the start. For the exciting young Bellof, it would be the best finish of his career, evidence of the unfulfilled potential after his fatal crash later in the season. The second Tyrrell of Martin Brundle had seemed poised to do even better. Just before halfway he was snapping at the back of Johansson for third when the pair came up behind the RAM of Philippe Alliot. Alliot moved over for the Ferrari but had not noticed Brundle and veered right into him as he passed. Team boss Ken Tyrrell was left to mourn the last outing for the old non-turbo engine. "It's the end of an era, the start of a new one," he said. "I am sad."